Today I made a quick drive from Petra to the Dead Sea. Which makes you think that the next logical step is visiting the highest point on earth. Well, it’s not going to happen – my height-phobic companion has already made that clear. 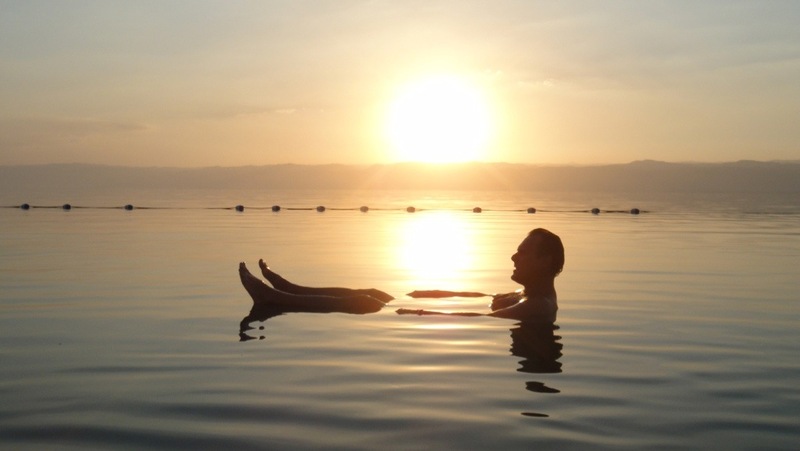 So the Dead Sea it is – which is just that. No fish, no coral, no seaweed, no life. Just lots of salt, in fact 33%. Which makes you cry like a baby if you have any cuts or sores; even my early morning shave resulted in the smallest wave of tears. The coolest thing of course, is that you float. In fact, you can’t sink or dive. It’s physically impossible. You sort of bob if you are standing in the water. If you are on your back, it’s like having an inflated mattress under you. 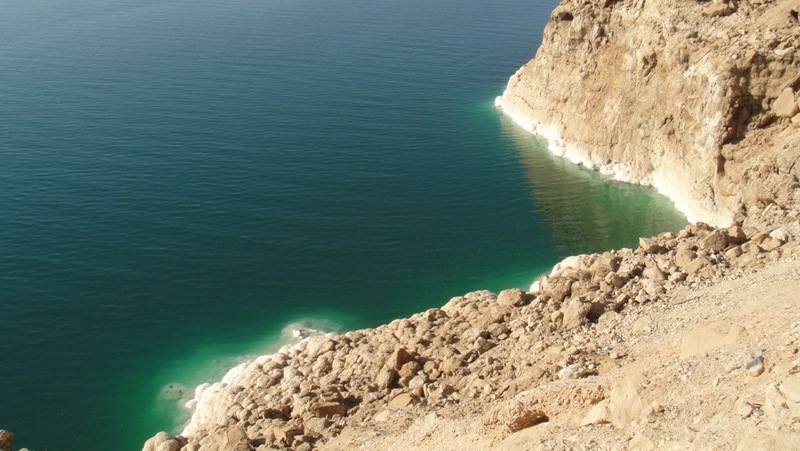 The Dead Sea treatment is a process where you smear the abundant gooey mud all over your body, wait until it dries, and then wash it off in the Dead Sea. It actually makes your skin smooth and soft. If you’re a “Spa” addict, I know you’re thinking ”Well drrrr”. For me, it was a revelation. Although after a swim and two showers, my skin is still tingling, and I still smell like mud. It was strange sitting on a salt beach, lathered in mud, with numerous people from the four corners of the world (yes, I know the world is round) also looking like Mud Monsters. Even more strange on this beach of small rocks and salty sand, was a vacant towelled sun lounge, umbrella and clothed table with a vase of flowers. All became clear when a hotel employee appeared on the beach and dressed the table with fresh water bottles. Then a golf buggy descended down the sandy slope from our hotel with four foreign gentlemen riding in it. One particularly old Italian man was assisted from the buggy to the sun lounge, while two other older men sat at the table making loud phone calls in Italian. The last man, dressed completely in white, stood at attention and waved a fly swatter over the lounging elderly man for the entire time the group visited the beach. Even smeared with more mud than a water buffalo, I didn’t notice any flies. Now you must admit that it’s not normal. I couldn’t get the theme from “The Godfather” out of my head. My fervent imagination said “Mafia”; apparently, we had timed our visit with The Don’s annual spa holiday. That explained the two security checks before we were allowed into the hotel. The Mafia visit lasted about twenty minutes, before The Don’s minders escorted him into the water and then bizarrely bobbed him up and down in this magical sea where everything floats. 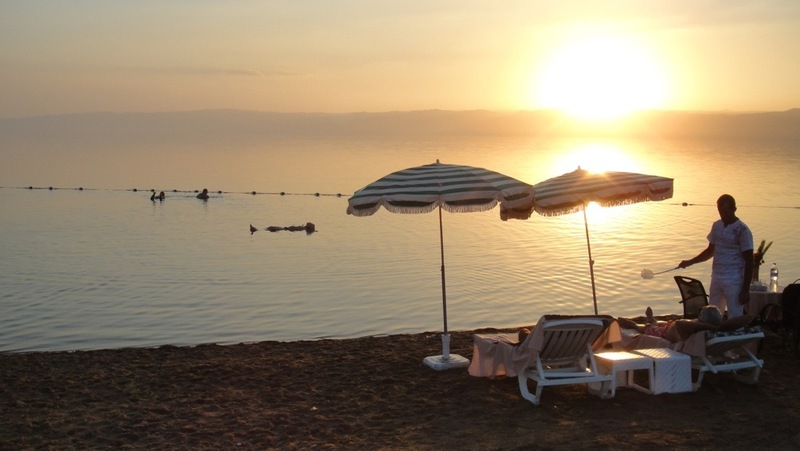 It could have been an attempted Mafia take over, but well, I think it would be impossible to drown anyone in the Dead Sea. Ok. I acknowledge my imagination is working overtime. It’s a balmy 29 degrees. 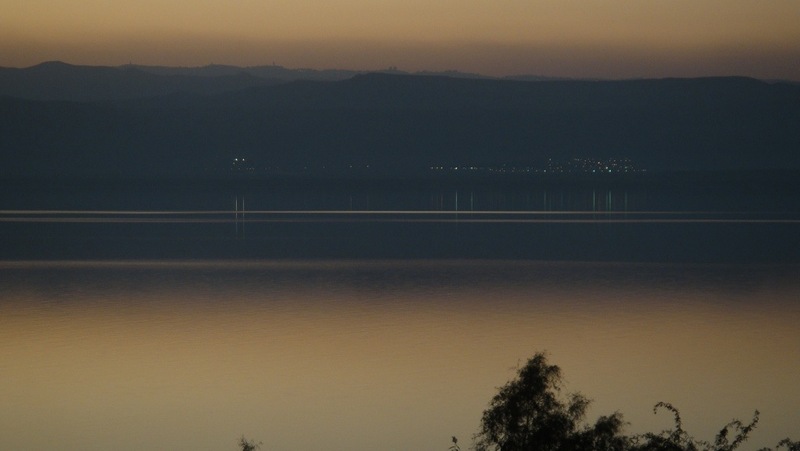 I’m sitting on my hotel balcony looking at the sunset casting purple and gold reflections over the Israeli mountains and onto the Dead Sea. It’s my last day of my two month travel odyssey. And I’m spending my time telling YOU about it. This entry was posted in Jordan and tagged Dead Sea. Bookmark the permalink.